So, I'm still confused here. 9.0.24.28 annouced on 2018-10-31, release notes still up (saying gradual roll-out; fair enough). So at the moment the official version is at 9.0.24.28, but all the downloads are at 9.0.21.18 and I need to dig in a beta forum to find out what is going on. I'm all for releasing it only 'when it is ready', but please get your communication chanels sorted. 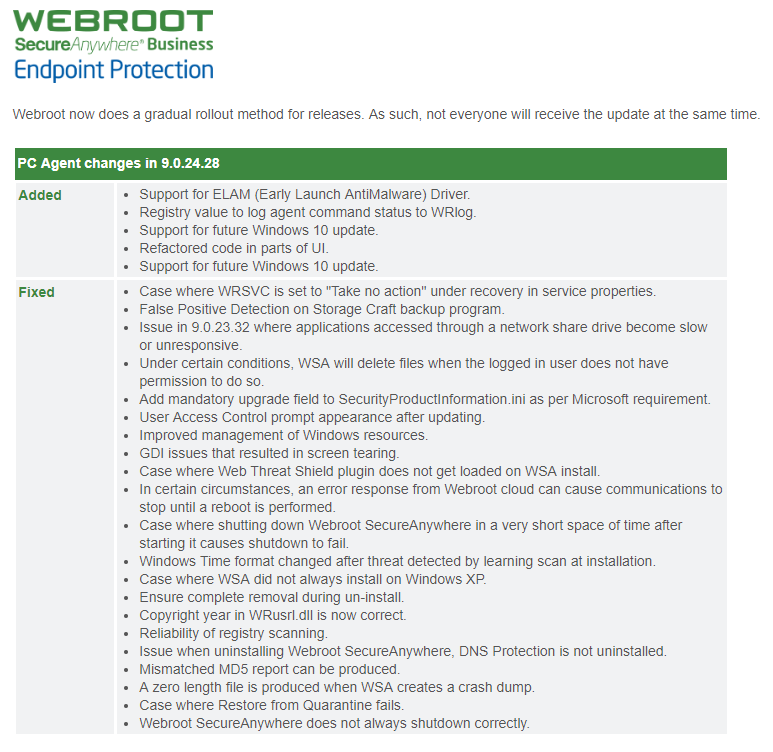 1. https://www.webroot.com/us/en/business/support/release-notes for fully tested, actually released & available versions with option to accelerate past the 'gradual rollout' . Recalls / release has paused notices etc. go here too. 2. beta: Anything that is 'unsupported' goes in the beta group. This can be a lot more informal, but please let us know there if there's an issue, and/or you're pulling an specific beta version. Have 1 authoritative voice that will let us know the status / issues etc. We're volunteering to help, please make that easy. I'd be more than happy if I came across a message in the beta group that said: "we've found this issue [description] with version 9.0.X.Y. Please revert to release version 9.0.21.18 for now. We'll post an update here when a new beta is available." 9.0.24.28 is not the official release. We'll be publishing at least one more potential release candidate. Okay, now I'm really confused, @JGiffard . Should there be a Product Release note for this when there isn't an official release? I'm just trying to make sure that I truly know when there is a real product release, I'm working on a proper testing cycle for us here, so I need to ensure I know when an update is the real production deal (vs. anything else). @akim Can I confirm that the release in that group (I am a member) is the official release build you have listed? Just making sure prior to deploying internally. @DTMT - You can get the installer the pre-release evaluation builds in the private Business RC evaluation/beta group. If you do not already have access, please request it and I will let you in to the group. @akim Can you please let us know where the download locations are for the business versions of this release? and am getting the 9.0.21.18 installers. I need to get the installers for this version for the systems we test in-house prior to deployment of a production version.